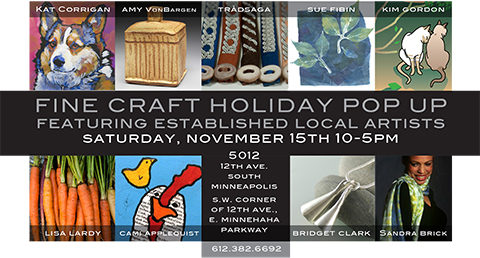 As I print, pack, and prepare for one of my favorite art/social events, it occurred to me that I haven’t invited you to stop in on Saturday, November 15, 2014, at the Fine-Craft Holiday Pop-Up. This gathering of ten accomplished local artists is hosted by Bridget Clark, creator of contemporary silver jewelry. The founder of this festive event, and host for seven years, is photographer/interior designer Lisa Lardy. Please top by to see new work and renew old acquaintances. We look forward to seeing you!